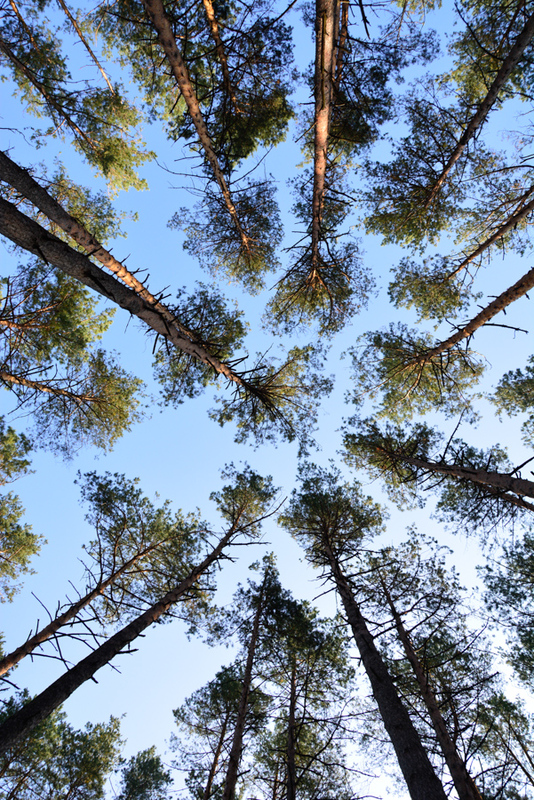 Since the Belarus-Ukraine border crossing went smoothly and quickly, we had exactly enough time to find the perfect spot for a campsite, a few km from the border, about 1 km off the main road, straight in a wonderful forest. 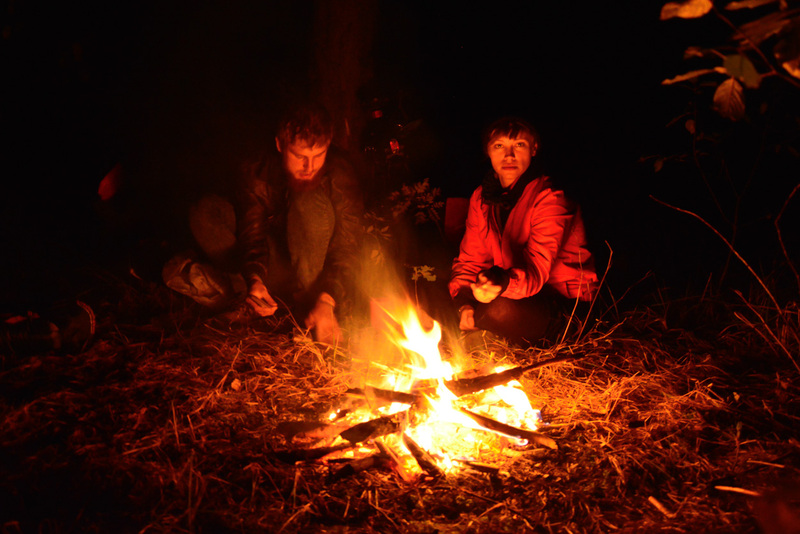 We made the first real fire in our trip, and played cards. It was absolutely glorious. The next day, even though our tent was extremely wet, we woke up and it was sunny. The kind of weather, when you are not entirely sure if you should wear a jacket or a tank-top. So how come at the end of the day I found myself standing alone in rain, on a platform at the Kiev-Moskovsky (Київ-Московський) Railway Station, with all our bags spread around me but only one bicycle? 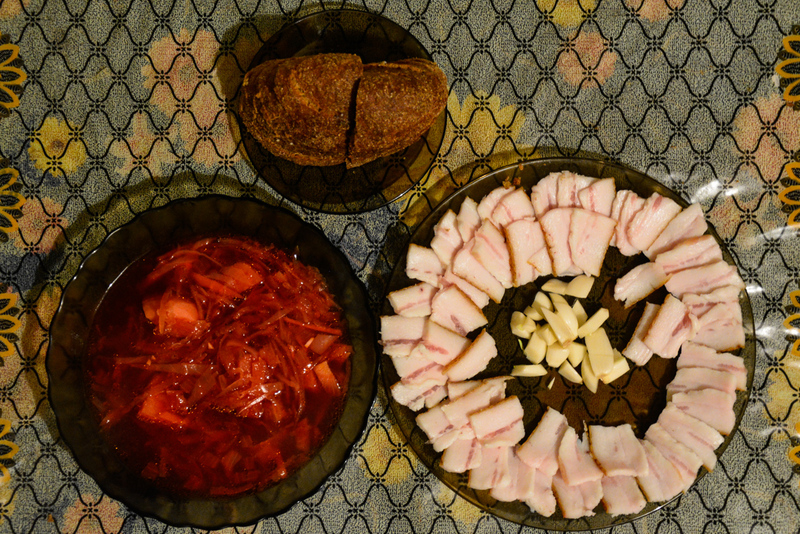 I knew, I was in Ukraine, when stopping by a roadside shop in a small town/village called Ripky (Ріпки) I was approached by two very suspicious older men (Ivars and Dainis were inside the shop at this point) and asked in Russian Ukrainian “Who are you?” and “Where are you from… Why are you here?” To which I awkwardly tried to answer “We are simply travellers, tourists cycling through.” This was enough for an answer to one of the men, suppose because I am a girl after all, so no real threat to them. This man then tried to calmly explain the situation to his friend. We were “all friends” by the end of it and we even got help choosing the best local Ukrainian beer. Deciding it would be great to stop and soak up the lovely weather and our new insights, we see a table in a small birch grove, next to some houses. 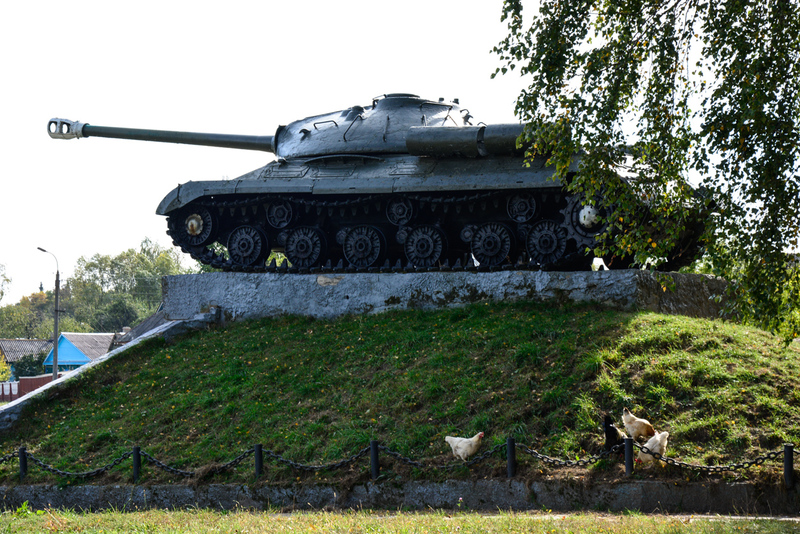 It takes us only a few moments to realize there is a tank monument right next to it, only this time the setting is much different from the previously visited ones in Belarus… This time there’s chicken, simply walking around and on the monument, the second sign we’re in a different country. Neither did we see a single Lenin’s monument that day. Time flies if the weather is great, so we got back on the road and cycled south to the historic city of Chernihiv (Чернігів). The further away from the border, the worse the roads got. On one hand the condition of the road could give us a serious headache, since our bicycles during this trip are also our homes (precious not to break them to pieces.) On the other hand, this meant, the cars would not drive too fast and reckless. Yet, to be honest, I’m not even sure if this could have been a problem, since most of the cars being driven in this part of the country are Lada «Zhiguli» and judging by their condition, they are first editions from the 1970s. So after some 70 km cycled in a straight line during the first part of the day, we rolled in Chirnihiv in an early afternoon, covered in flies (they seemed to cruise in the opposite direction of us that day and especially into Ivars’ beard.) The sun still showing off its 1000W smile, felt quite a shame to take the train in order to get to Kiev (Київ) the same night but arrangements had been made with our new host Roman already, so we followed our initial plan and after a cheap lunch, got 6 tickets (3 for us and 3 for our bikes) to Nizhyn (Ніжин) and then planned to transfer to Kiev. Another indication we have entered the lively Ukraine was the trains – filled with energetic vendors, bakers and self-proclaimed merchants. Selling all the goods imaginable, from water, tea & coffee out of simple thermos and big flasks, to hair bubbles and plasters but particularly beer and belyashi (Беляши – deep fried pastries with beef filling), these people made the train ride seem more exciting and interesting, winding up somewhat forgotten memories of childhood when these activities were common in Latvia as well. Also worth mentioning I think is the “train musician” we encountered. Cheerfully sipping our purchased kvass (квас – a fermented beverage made from black or regular rye bread, quite a popular drink in Latvia as well) we were suddenly surprised by a woman who had been standing at the door just seconds ago. 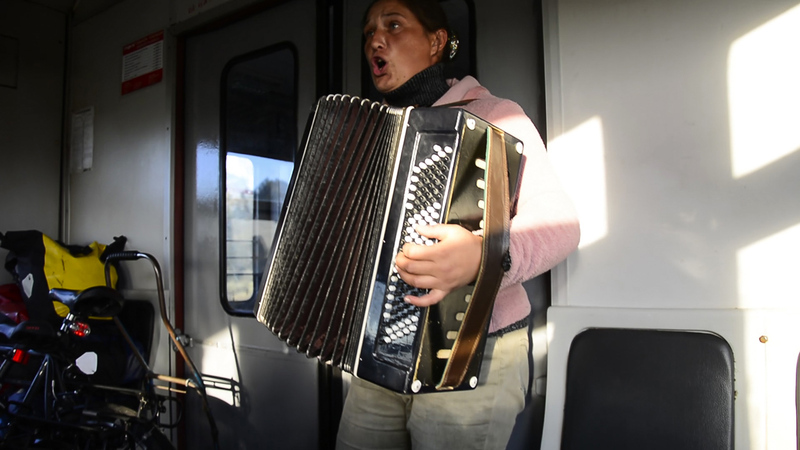 She started singing a touching folksong accompanied by accordion whilst moving up and down the carriage. At that moment, grasping to some of the words I could understand, I knew we had arrived to the country of blue sky and yellow fields , as promised when you look at the Ukrainian flag, and in the afternoon sun (unfortunately not cycling but looking outside the window) it felt true, simple, classic. Somewhere between Nizhyn and Kiev the sun had set and sitting in the train didn’t seem like such a bad idea in the end since the sunny warm day was now history. We dragged our 17 bags and 3 bikes to the very door of the train, prepared to jump out the moment it rolls into our station. As soon as the train stopped, I jumped out and in this haze we somehow got all our bags on the platform. 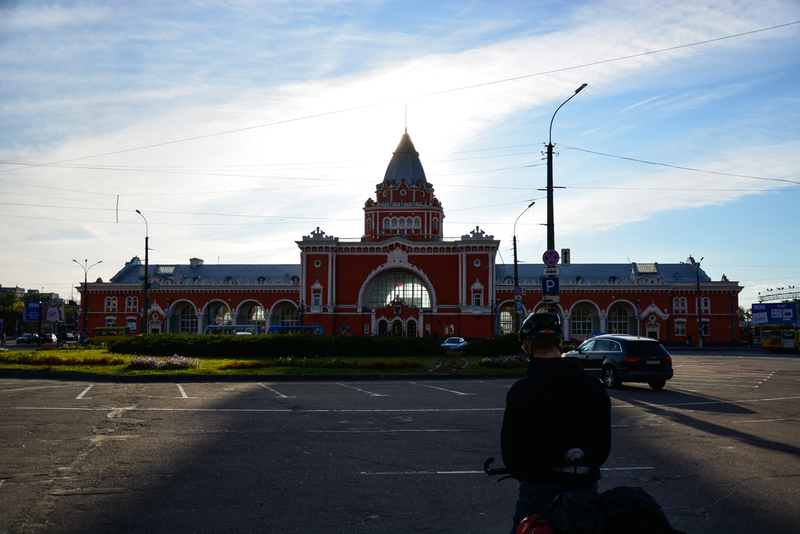 Then, the second I got my bike, the doors shut and the train started moving again with Dainis and Ivars still in it. So there I was, finally in this big, exciting city, stuck – standing on a platform in Kiev-Moskovsky with 17 bags and 1 bike and it was starting to drizzle. Thinking all will be good as long as the rain doesn’t start pouring, I put on my jacket and waited. 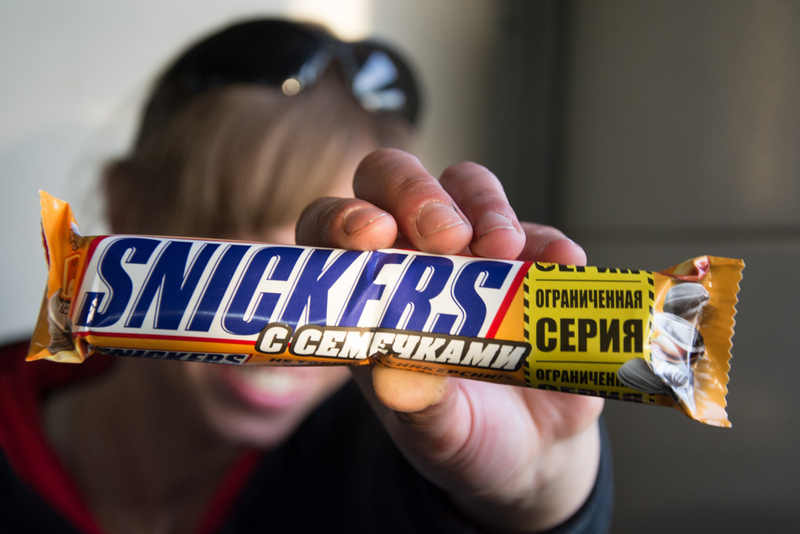 The phone reception was obviously terrible and I couldn’t get in touch with the boys but at this point I already knew, they would just jump out at the next stop and cycle back, similar to our situation in Soligorsk “really… they will” I knew. All I had to do is explain this to our new hosts – Roman and Sveta, who had thankfully arrived at the station to greet us and had just noticed me on the platform “Yes!”, and were now wondering, where is Ivars and Dainis… But all is well that ends well, soon after we were able to get in touch and were reunited and less than an hour later…in our hosts’ house, treated with drinks and some traditional Ukrainian salo (сало – cured slabs of fatback) and borscht (борщ – soup with beetroot as the main ingredient). We were home… well, for the next ten days anyway.